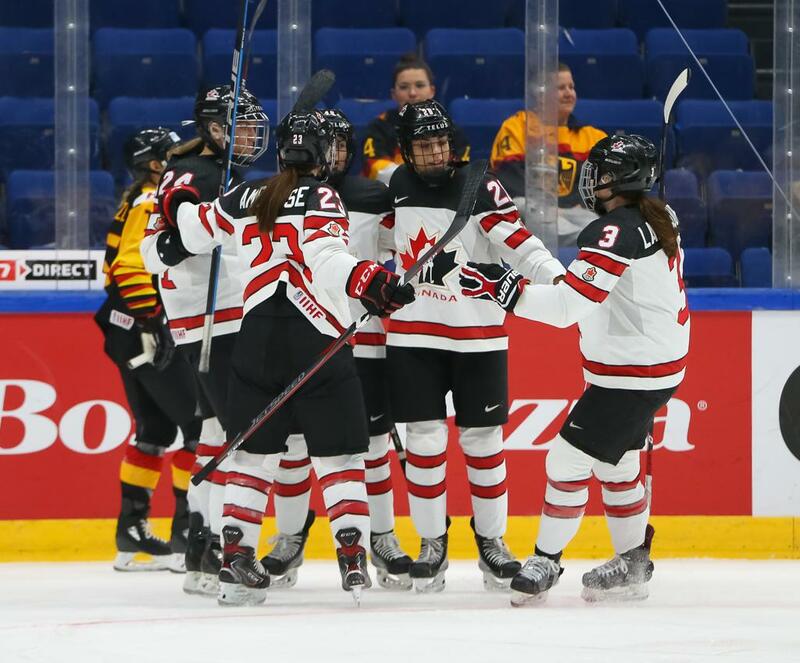 Team Canada advanced to the semifinals of the IIHF World Championship with a 5-0 blanking of Germany in the quarterfinals on Thursday in Espoo, Finland. With the new 10-team format of the tournament, no teams earned an automatic bye to the semifinals, setting up the quarterfinal matchup between Canada, the second seed in Group A, and Germany, the second seed in Group B. Strong as a Turnbull: Blayre Turnbull (CWHL Calgary Inferno) led the way for Canada with a pair of goals in the victory, book-ending the scoring by netting Canada’s first and fifth goals. B & B on the PP: Brianne Jenner (CWHL Calgary Inferno) and Brigette Lacquette (CWHL Calgary Inferno) have been lethal on the power play during Worlds. Jenner scored a power play goal of her own with an assist from Lacquette in the second period, before the pair set up Natalie Spooner (CWHL Toronto Furies) for a tip-in in the third. Lacquette now has five assists in the tournament, and Canada’s power play is operating at over 38 percent. Get it Back: Canada had a pair of goals waived off in the quarterfinals, but the team didn’t miss a beat. Spooner’s goal came just 13 seconds after one had been called back. Shoot, Shoot and Shoot Some More: Canada’s plan of attack throughout the tournament has been to control play through puck possession and offensive chances. The Canadians outshot Germany, 66-9, in the quarterfinal, and have outshot their opponents, 246-76, throughout the tournament. Canada now awaits the winner of the quarterfinal matchup between Finland and the Czech Republic for a semifinal on Saturday.